From the collection today is a photo originally from the collection of manager Cal Ermer. 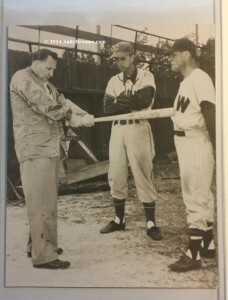 The photo features former MLB player Rip Collins, manager Cal Ermer and Washington Senators manager Bucky Harris. The photo was taken in Florida in the spring of 1952. The Chattanooga Lookouts were the top farm team of the Washington Senators and held their spring camps close to each other. The Chattanooga Lookouts won the Southern Association championship in 1952.